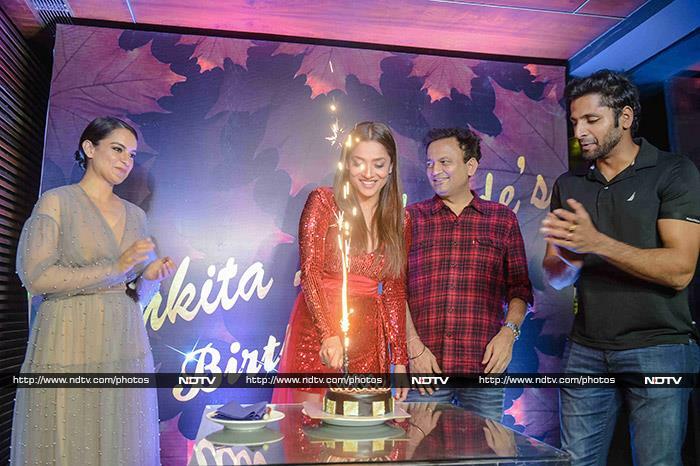 For Ankita Lokhande it was double celebration on Tuesday as the trailer of her debut film Manikarnika: The Queen Of Jhansi released on her birthday. After launching the trailer of Manikarnika together, Kangana and Ankita celebrated the latter's birthday. Scroll down for pictures from the party. Kangana wore a silvery tulle dress to Ankita's birthday bash. Ankita dazzled in a red asymmetric outfit. Mouni Roy, Ankita's bestie from the small screen, wore a black outfit with boots. Sanjeeda Shaikh needs a stylist. Ankita received this present from team Manikarnika. In Manikarnika, Ankita plays the role of Jhalkari Bai, a close aide of Rani Laxmi Bai (played by Kangana). Neeta Lulla, the costume designer of Manikarnika, was also on the guest list. Screenwriter Mushtaq Sheikh and businessman Rohit Reddy (who is married to Anita Hassanandani) smiled for the shutterbugs. We also spotted casting director Mukesh Chhabra at the party. Take a look at Ankita's swanky ride.